Automatic Filling Packing Machine - CC-1203 suitable for filling weighing and packaging various granular products, such as crude sugar, red beans, rice, green beans and feeding stuffs etc. The Automatic Filling Packing Machine - CC-1203 automatic bag forming electronic weighing filling packaging machine is suitable for all types of granular products. Printing points photoelectric sensor is easy to adjust to eliminate waste of packaging film. Simply inputs packaging length in case of no printing points photoelectric sensor. The transmission system of the packaging machine is driven by a servo motor (Mitsubishi from Japan) for high accuracy. The controller provides a self-diagnostic function. In case any machine trouble occurs, such as no packaging film, no color type, photoelectric sensor error, excessive or under sealing temperature or air pressure failure etc, the machine will display problem points and trouble-shooting instructions. Easy to set filling weight. Filling weight accuracy is controlled within ±1%. The weighing unit features automatic reset. Graduation of load cell is 1g. Related Products Name: Sugar Filling Machine. 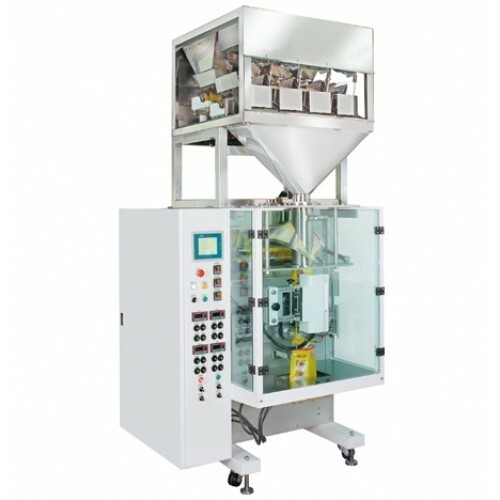 If you are interested in our sugar filling machine, please contact us online.